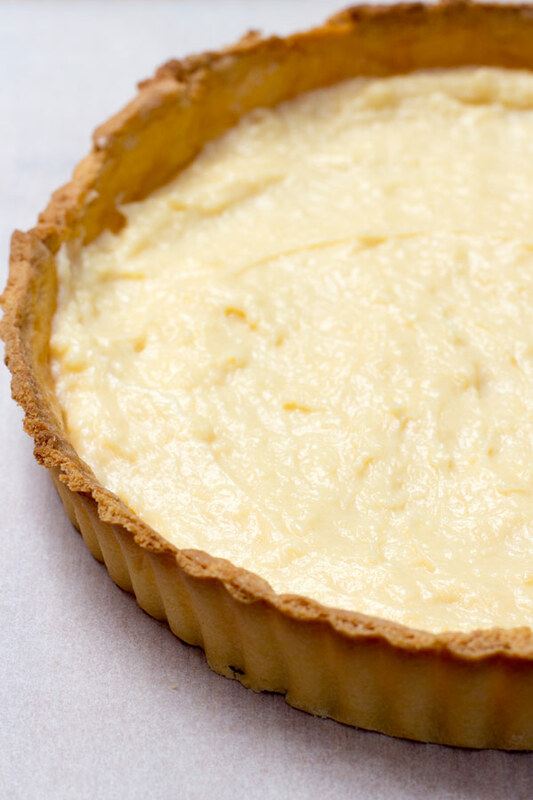 It’s the first post of the NEW YEAR, and there is no time for New Year resolutions in this household, there is only time for a tasty fruit and custard tart! This classic fruit and custard tart has four components, a fluted edged sweet pastry crust, luscious crème patissiere, whipped cream and glistening rows of fresh fruit. 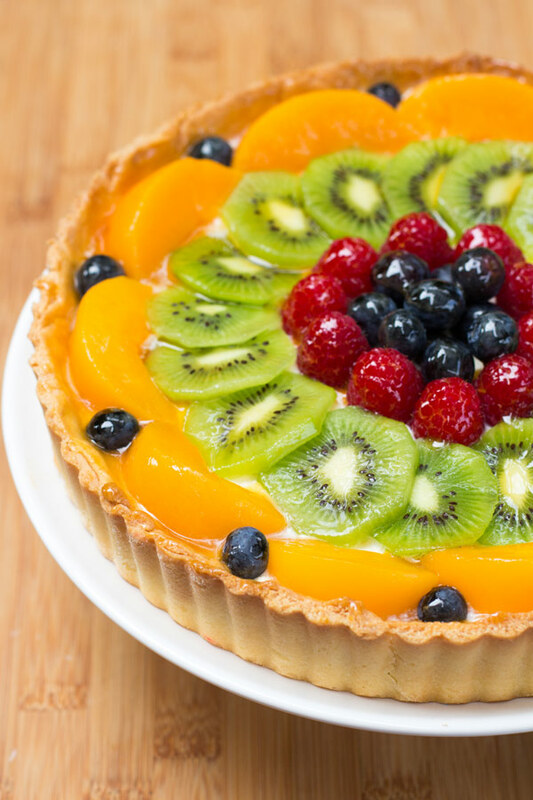 While the components of this fruit and custard tart can be made a day or two in advance, it is best enjoyed the day it is assembled. The cookie-like pastry crust has a sweet flavor and a crisp texture that is the perfect case for holding the pastry custard and cream. Once the crust is baked and cooled, the crust is then sealed by brushing on a thin layer of apricot glaze. This will prevent the filling from softening the crust over time. 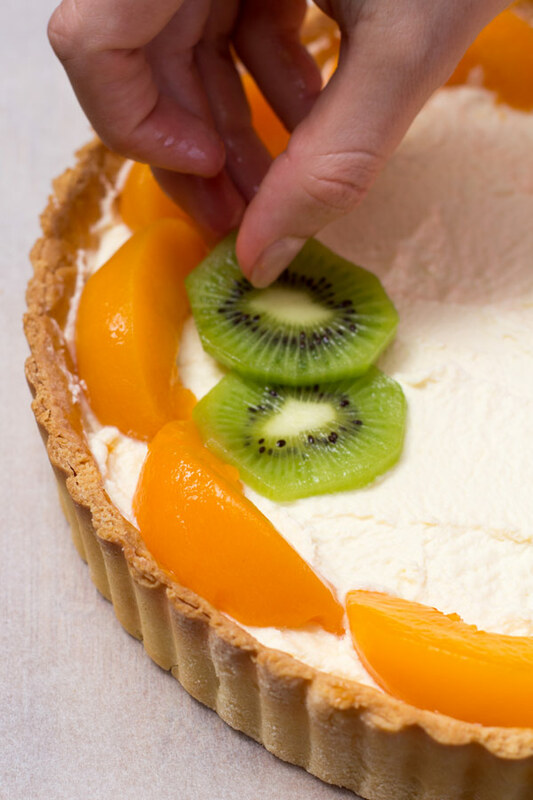 The classic filling for a fruit tart is crème patissiere, which is a rich, thick custard made from a mixture of milk, vanilla, eggs, sugar, flour and cornstarch (a thickening agent) that is cooked on the stove. 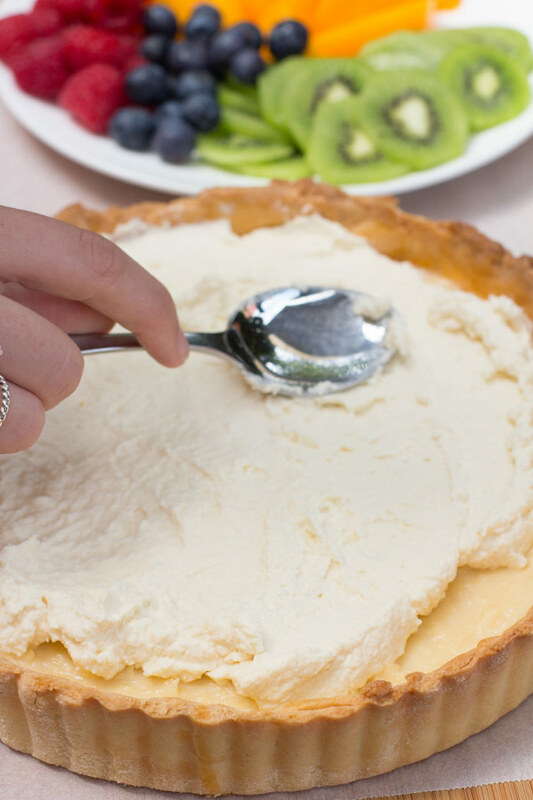 We added a layer of whipped cream on top of the pastry custard before applying our fruit. 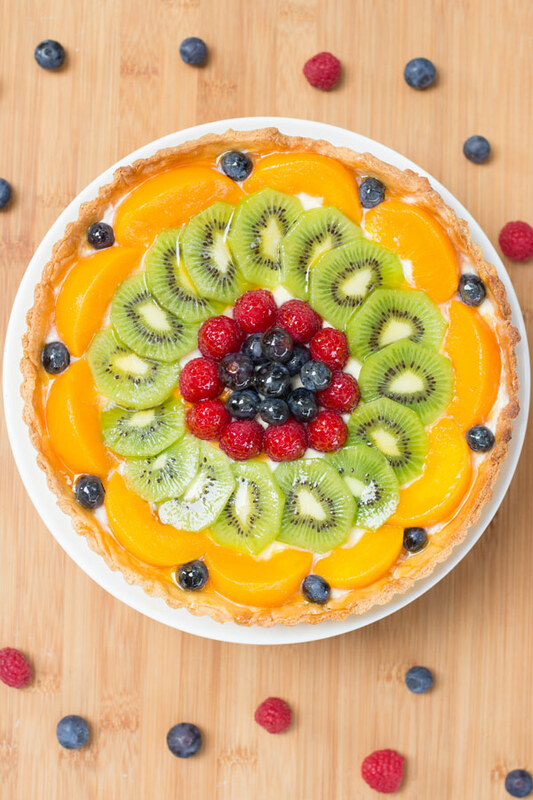 Of course, the first thing you notice about a fruit tart is the beautiful fruit arranged in concentric circles on top of the cream. There are so many fruits to choose from but it is important that the fruit looks and tastes its best. While berries, with their vibrant colours, are always popular, other fruits are nice as well. We opted for preserved peaches, slices of fresh kiwi, blueberries and raspberries. To finish off glaze the fruit with either an apricot glaze (recipe included) to give the fruit a lovely shine and it also prevents the fruit from drying out. Looking for other fruit based desserts then check out our Grilled Peaches with Ricotta and Balsamic Glaze or Apple and Rhubarb Crumble. Place the flour, butter and sugar in a food processor and process until the mixture resembles fine breadcrumbs. Add the beaten egg and process until the mixture just comes together. Turn the dough onto a lightly floured surface and knead until smooth. Flatten the pastry into a disk, cover the pastry into a disk, cover with plastic wrap, and refrigerate for 15-30 minutes or just until firm. Lightly spray with a non-stick vegetable/flour cooking spray, an 8 - 9 inch (20 - 23 cm) tart pan with a removable bottom. Evenly pat the chilled pastry onto the bottom and up the sides of the pan. Cover with plastic wrap and place in the freezer for about 15 minutes. Meanwhile, preheat oven to 400 degrees F (205 degrees C) and place rack in center of oven. Lightly prick bottom of pastry crust with the tines of a fork (this will prevent the dough from puffing up as it bakes). Place tart pan on a larger baking pan and bake crust for 5 minutes. Reduce oven temperature to 350 degrees F (180 degrees C) and continue to bake the crust for about 15 minutes or until dry and lightly golden brown. Remove from oven and place on a wire rack to cool completely before filling. Can be covered and stored for a few days. In a medium-sized heatproof bowl, mix the sugar and egg yolk together (Do not let this sit too long). Sift the flour and cornstarch (corn flour) together and then add to the egg mixture, mixing until you get a smooth paste. Remove from heat and add slowly to egg mixture, whisking constantly to prevent curdling. (You can strain the mixture, if you get lumps). Pour the egg mixture into a medium saucepan and cook over medium heat until boiling, whisking constantly. When it boils, whisk mixture constantly for another 30 - 60 seconds until it becomes thick. Pour into a clean bowl and immediately cover the surface with plastic wrap to prevent a crust from forming. Cool to room temperature. Beat or whisk before using to get rid of any lumps that may have formed. Lightly whip 300 ml of fresh cream using an electric beater. Heat the apricot jam (preserves) and water in a small saucepan over medium heat until liquid. This can also be done in the microwave. Remove from heat and strain the jam through a fine strainer to remove and fruit lumps. Remove the tart from the fluted sides of the pan. Spread a thin a thin layer of apricot glaze over the bottom and sides of the baked tart shell to prevent the tart from getting soggy. Let the tart dry for 20 minutes. Add first layer of creme patissiere. Add second layer of whipped cream. Place fruit in concentric overlapping circles, starting at the outside edge. 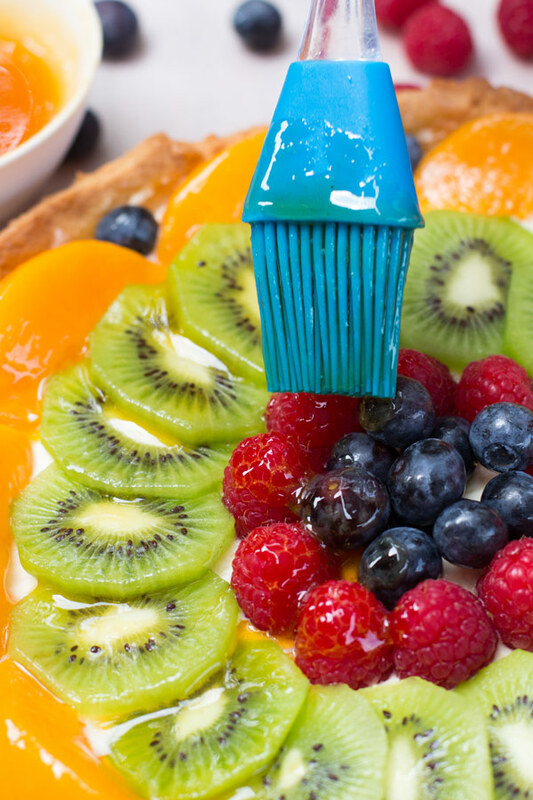 After arranging the fruit, rewarm the glaze, and gently brush a light coat on the fruit. Serve immediately, or if refrigerating bring to room temperature before serving. This fruit tart is best eaten the same day as it is assembled. Cover and refrigerate any leftovers.